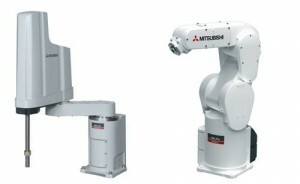 Mitsubishi has released the latest in a series of vertical-axis robots that are designed to perform particularly dexterous and complex tasks formerly operated by humans in a factory setting. RV-F is the new release in the company’s F series of six-axis vertically articulated robots designed for speed, precision, and ease of integration, according to the company. Advanced features such as a force torque sensor and coordinated motion and automatic collision avoidance make the RV-F and F-series robots particularly well-suited for tasks such as material handling, machine tending, assembly, picking, packing, kitting, dispensing, and inspection, Sunny Ainapure, a senior product manager for Mitsubishi Electric Automation, told Design News. “Vertical articulated arms are more flexible and can help reduce the cost of other components in an application,” he said. These tasks, usually reserved for humans, can now be performed by robots like those in the F-series. Indeed, even as assembly and processing tasks become more complex, factories and production plans are looking to reduce costs and improve productivity through more automation. Mitsubishi and other companies offering robots for factory-automation systems are responding to this need with more sophisticated technology that can do more, Ainapure said. “The new F series are faster, have higher payload, larger work envelops, much higher toleration of inertia, collision avoidance, robot cooperation, have dress packages through the center of the last axis, force torque sensors, and have grease changes at 24,000 hours,” he told us. The RV-F also features internal routing of cables and hoses, as well as standard features that span the entire F-series line. Those include 64-bit RISC processing, multi-task programming, plug-and-play interface to Cognex cameras, and USB and RS232 ports, which make them easy to connect to a PC. Mitsubishi’s F-series robots also comply with ANSI/RIA/ISO 10218-1-2007 safety standards and are available in CE for global acceptance. They are available in both vertical and horizontal configurations, according to Mitsubishi.